NextSt. Vincent – ‘Masseduction’ album review. To family and friends and the people she interacts with on a daily basis, she is simply the down to earth Erin McLaughlin. But once you get Erin up on stage she remarkably transforms into the captivating and headstrong Ruby Force. This talented Californian musician who got her start singing in church, took a hold of her life experiences and love for music to create an alt-country album that brought her to the attention of Rolling Stone magazine. It would be easy to label Ruby Force as simply just a country music star, but there is more to it than that. Her brilliant debut album Evolutionary Wars takes us on a whirlwind journey of self-discovery through elements pertaining to rock, Americana, soul and folk. Its infused sounds, might feel like a lot to digest, but believe me when I say that this album will engage, thrill and maybe make you tear up a little. The arousing sounds of acoustic and electric guitar, especially on Damn Your Love, Dancing As I Go and Tender are tracks that showcase just how left-of-center she really is as an artist. And that’s a good thing, because by album’s end on Why Do You Leave, she truly transcends all that is what is traditionally country, with a powerful ballad worthy of being heard in any genre of music. 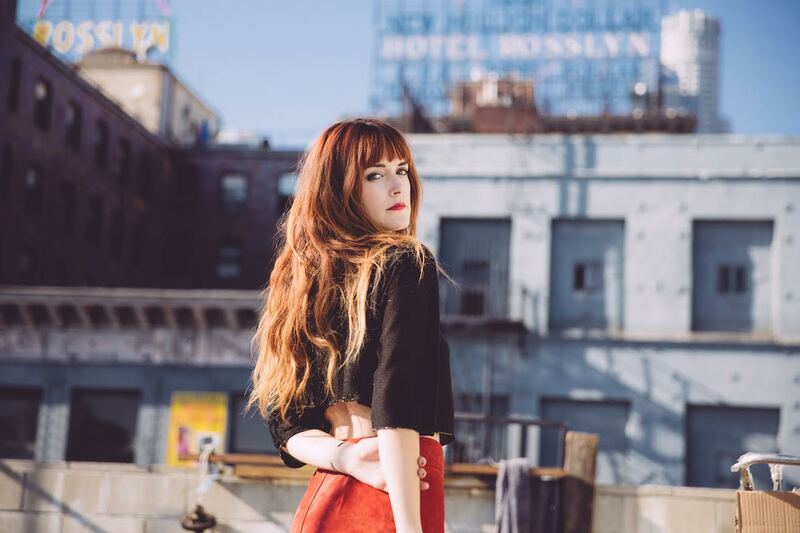 That said, I was fortunate enough to catch Erin McLaughlin aka Ruby Force, in between shows, to talk about her debut album, music and inspirations. Here is a little of what we talked about. You go by the moniker Ruby Force instead of your own name Erin McLaughlin. Is that something Erin, you intentionally decided to do? And why? The change was indeed intentional. It was something that Eli (Erin’s producer) and I discussed on a porch one night near the end of recording Evolutionary War. He suggested and I agreed that a moniker makes sense for me. Ultimately I believe it’s a way to clear some space around myself personally for some artistic expression. Choosing it was somewhat incidental and also, not. Objectively the whole thing seems a bit nerdy but that’s a part of who I am too, nerdy and strong and self-possessed. And maybe that version of me is too much for the family, or at work or at a kick-back for a friend’s birthday. It’s perfectly acceptable for the stage though. I’m not sure. What may surprise you may be completely boring and common place to someone else. Mama tells me that I started singing along with Cyndi Lauper when I was scarcely two years old. Makes sense to me. I don’t remember that far back but Cyndi’s music has always made me feel more like myself whenever and wherever I hear it. Who can say what first compels a body towards its heart’s delight other than the fact it makes a person feel good. Making music makes me feel real good. I guess since that’s the case, it was only natural I should find myself here. My parents never pushed me in this direction. Looking back I was magnetized towards music. I played flute in the 3rd grade band but got kicked out because I was learning the tunes by ear. The whole “language of music” is hard for me. It’s never stuck to my brain, despite the patient efforts of many talented professionals. It just doesn’t hold. Melody makes sense to me. It’s less confined, meaning I can get started right now, just by humming but it does follow the same rules in the end. Maybe that’s why the musos haven’t given up on me yet. Nevertheless I maintain the goal of learning music theory to an extent eventually and some of it has snuck in over the years as a matter of formal communication with the brains I’ve had the pleasure of working with. Was anything in particular inspiring you during the making of Evolutionary War? This record is a collection of songs I was playing and writing over a large span of time so inspiration came from disparate experiences. Obviously all of the songs theme lyrically around love, in some form or another. Love makes me write. For better or for worse, my journals reflect the same. My short stories and poetry revolve around love. It’s an ache and a comfort and a light; the strongest motivation in my life. It’s cool to write about inanimate objects and other less obvious sensations too. As I mature as a writer perspective changes, stories develop in varying contexts etc etc. and some of that will roll into future recordings. The truth remains however; l gotta lotta love in me yet. There is something about the albums opener Church and State that suggests a homage to your hometown. Why did you decide to begin the album with this song over the others? Yes, the song works beautifully because there’s a real house on the real corner of Church and State Streets in my real hometown of Redlands, CA and I was really living in it with my three best friends when I wrote it. Angela or “A” said to me one day, “You’re always writing about boys who break your heart, why don’t you write a song about us?” So I did. It was placed at the beginning of the record because I wanted to arrange the songs as much like a rock opera as possible and it seemed fitting to start there. I imagined heavy red curtains parting and the protagonist sitting alone, musing the deeper stuff of love; love that listens and cares and abides, brotherly love. Like Church and State, I wonder was having Why Do You Leave at the end of Evolutionary War a deliberate choice. The whole sound and your layered vocals makes for an epic finale. How did it come together? Why Do You Leave is a simple song lyrically, and even chordally, but I told Eli I wanted it to emote sonically with more complexity. He, Frank and Swift brought the storm completely and I relish totally, hearing it thunder and crack. If the record could be pieced together theatrically it would tell more like a tragedy than a comedy to me overall, so it made sense to draw the curtain there. But “why” is a question. It’s open ended and I’m still here, waiting for the answer. Then again, I liked how if you were listening to the record on repeat the next sound is a soothing return to home, or love optimistically, with Church and State. Such is life you know. The unifying quality of the album seems to be your ability to tell a story through your music, especially about heartache and love. Every song to me seems to ebbs and flows with emotion. One minute it can be haunting and the next we are toe tapping. How did you decide on the structure of the album? Did that happen very early on or was it something that was born out of your recording sessions? All of the songs, with the exception of Tender, I wrote. They are from the years of my life and although they are not necessarily ordered chronologically it makes sense that they fit together and tell like a story. I’m a writer. Finally finished my degree last year at Cal State Long Beach (where Spielberg graduated) in English with an emphasis in Creative Writing, which may surprise you (CALL BACK!). My job was to write the songs and sing them. Eli Thomson, the producer of this record, interpreted, themed sounds, strung old bits and new together, and paved roads for the future. If I tried to totally answer this question I’d end up writing Volume One of my own Chronicles. I’ll just say, we both gave it our best to bring these stories to life cohesively in a record. Erin, you don’t seem to be afraid to experiment across the album. We hear your amazing acoustic guitar, which draws on everything I often associate with country music. But at other times you draw on rock and I would guess your love for indie alternative country pop. Is that a fair assessment? And how does this all fit into Ruby Force’s worldview? I didn’t set out to make an expressly country sounding record and we didn’t end up with one. I had some tendencies, writing with an acoustic guitar, hanging out with bluegrass musicians etc. And initially, there were conversations about genre and which way to push it and I wasn’t scared to go classic. But I didn’t grow up on country music and as a result I can be a little less reverent to the genre when composing for myself. I got into it through side doors later in life and you’re going to hear that in my sound, so it is a fair assessment. And it’s ok, it’s the truth and it flowered into something cool and honest and I’m all about that. Which songs do you most love to play live? Typically the ballads. I’m a crooner. Lately though, especially with a band, I enjoy digging in to Damn Your Love. I’d dearly love to know who are some of the great music artists that inspire you? Finally, what in your musical career thus far has given you the greatest fulfillment or satisfaction? Getting to work with geniuses who believe in me and are willing to teach me something about art, music, life, work etc. 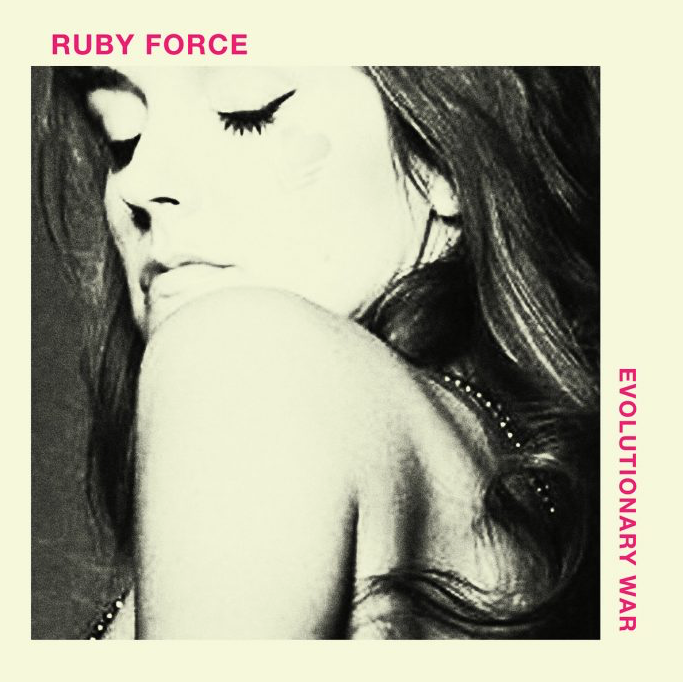 Ruby Force’s Evolutionary War is out now through Ruby Force Records and available via iTunes. You can connect with Ruby Force via her Facebook page or twitter feed @ruby_force. You can also visit or contact Ruby Force via her website. Follow Ruby Force on Instagram. Watch her on You Tube. Photo credits: All photos used are supplied by Erin McLaughlin and are ©Copyright by Casey Curry. They cannot be used without their expressed permission. I am not the uploader of You Tube clips embedded.